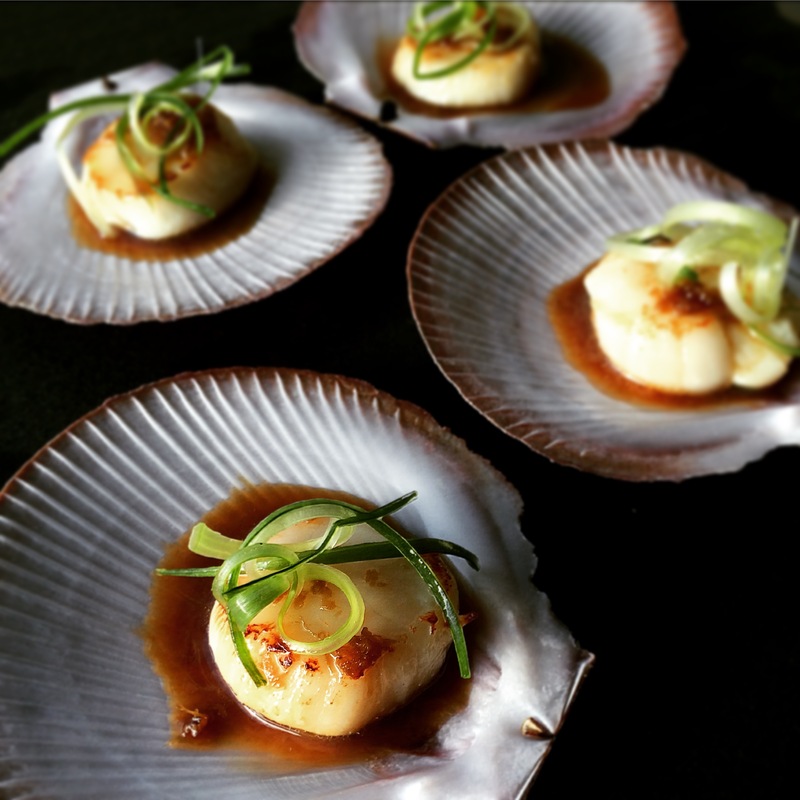 I was lucky enough to be given scallops in the shell to cook with – how spoilt am I?!? Keeping it simple with scallops is always best, with minimal cooking time and a nice clean dressing, you are doing justice to these delicate sweet morsels. The bonus of having them in the shells, is that it serves as a small bowl to capture all the juices and dressing. The shells can be cleaned for later use. Scallops are a lean source of protein, virtually no fat and are packed full of minerals and vitamins. I have cooked scallops like this before from frozen and you would never have known. Combine all sauce ingredients in a small saucepan over low heat, stir until sugar dissolves, remove from heat and set aside until ready to serve. Heat a little peanut oil in a large fry pan over medium heat. An easy way to get all your scallops in the pan at the same time, is to place them on a piece of baking paper and when the fry pan is ready pick up the paper and flip it over, the scallops will fall off. They will only take about 30 secs each side. The frypan needs to be very hot to get the caramelisation on the outside of the scallop. Serve immediately in the shells with 1/4 tsp of dressing on each, garnished with spring onion. If you would like curly spring onion, finely slice, place in a bowl of water and put in the fridge until ready to use. The dressing can be made a couple days ahead and will last in the fridge for up to a week. You will have dressing left over. If you put too much dressing on the scallops you will lose the delicate flavour of the scallop. Lovely presentation. I love to cook the coral with the scallop when available.